Transition lenses and high index lenses are two of the better technologies of modern eyewear. Transition (or photochromic) lenses automatically darken when exposed to the ultraviolet light of the sun and revert back to clear at night or indoors. This ability virtually eliminates the bother and expense of purchasing and switching between two separate pairs of prescription glasses, one for regular use and one pair to act as sunglasses. High index lenses allow for stronger prescriptions to be formed using less material. This reduces both weight and thickness, and opens up frame options that otherwise might not be available or desirable with thick or heavy lenses. 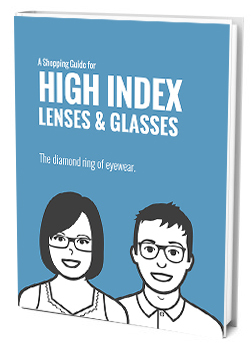 High index lenses also greatly reduce the distortion created by strong prescriptions made of standard lens materials. So can these two technologies, and their respective advantages, be combined? Are high index lenses available with a photochromic coating? The answer depends upon the type of high index material that is required. Transition lenses are embedded with millions of molecules that are transparent to most forms of light except for ultraviolet light. The process that adheres a coating of these molecules can be applied to plastic high index lenses but does not work on glass high index lenses. The use of high index glass or high index plastic depends upon your prescription, as some stronger prescriptions necessitate the use of glass only. For prescriptions stronger than those indicated above, the only high index option is glass lenses, and a photochromic coating would not be available. And so, the ability to combine the benefits of high index lenses with transition lenses may indeed be open to you but could hinge upon your individual prescription requirements.